Get your hands on Windows 8 Developer Preview today! Get your hands on Windows 8 Developer Preview today! Get your hands on Windows 8 Developer Preview today! Microsoft made available its next windows developers preview for developers. It is pre-beta version. 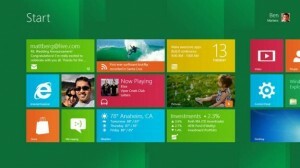 The Windows 8 comes with lot of improvements over windows 7 and natively supports all the windows 7 applications. Both 32bit and 64bit ISO images are available for download includes OS, Windows SDK for Metro style apps, Microsoft Visual Studio 11 Express, the Microsoft Expression Blend 5 Developer Preview and 28 Metro style apps. Windows 8 devices equipped with an NFC chip will be able to use a tap-to-share feature to either send data from one device to another, or simply receive data from an NFC equipped card.